The town of Jewel Bay, Montana—known as a Food Lovers’ Village—is obsessed with homegrown and homemade Montana fare. Erin Murphy has come home to Jewel Bay to manage the family general store and revitalize it by providing what the community wants, products made in Montana. She even convinces the town to add a festival to start the summer season, Festa di Pasta. She chairs the committee and organizes the first evening’s party featuring the culinary goods of Jewel Bay’s finest—including her mother Fresca’s delicious Italian specialties. The party takes an awful turn when a woman is found dead behind the store just outside a gate where the party is being held. The woman, Claudette, is a former employee of Fresca’s, who left town recently with a married man. Rumors start to fly. Fingers are pointed. People start to take sides. Erin’s friend Kim is the officer in charge of the investigation. Erin can’t believe Kim actually thinks Fresca is the prime suspect. Glacier Mercantile (The Merc) sounds like a perfect small town store going through some growing pains as Fresca still wants to do things her way and Erin is trying to modernize both the store itself and the bookkeeping. Change is always hard. A murder certainly adds some unneeded pressure to the situation. I have to say Erin is a wonderful protagonist. She has layers that are just starting to be revealed. She couldn’t wait to leave Jewel Bay behind a few years ago but working side by side with her mom is just the place she needs to be now. She is excited about the opportunity to use what she learned as a buyer for a huge grocery chain to make The Merc and the other shops in Jewel Bay a place were locals and tourists will want to shop. The author has surrounded her with an eclectic group of supporting characters. Fresca’s recipes will make your mouth drool!! Erin’s friend Kim is in a bind trying to stay impartial. I think she is going to have that problem a lot because with cozy mysteries you know the next book is going to put Erin in the middle of another crime. Tracy works at The Merc and sure loves her Diet Pepsi and she keeps a can right on the counter next to the register. Diet Pepsi is not a home grown product so it drives Erin crazy. I can’t wait to get to know her better. Several other Jewel Bay residents were introduced to us readers as well. Budewitz has also written a great mystery. There were clever twists that keep me engaged. It is hard to to delve deep into a whodunit and lay the proper foundation for stories going forward but this author has pulled it off. I can’t wait to shop again at The Merc!! Want to know more about Leslie Budewitz. Check out her webpage here. I’ve been to Montana so I’d really like to read this. Just wanted to let you know again how much I love your site and all the books you feature. One of my favorite and thanks for the giveaway. 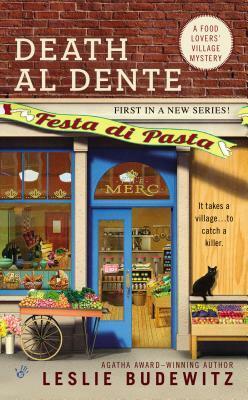 Thank you for the chance to win Death Al Dente, I’m looking forward to reading it. Great review, I can’t wait to read it. Thanks for the giveaway, hope I win. This story sounds so wonderful…can’t wait to read it!! Just the word food would get me to check out this book. I’m a foodie and a private chef (part time). I’d love to own it also. Sounds cute. I always love to try out a new cozy series! This looks like a great new series! Another cozy to add to my list! Another foodie mystery series- woo hoo! I can’t wait to read this series. I bought this one recently. So nice to know you enjoyed it. i’m really getting into these cozy mysteries.this one sounds great.thanks for the chance to win.